One of the delightful things about L.A. is that there are so many places in it where the line between urban and non-urban is about a half an inch wide. Sometimes you live on the line itself. At our house, for example: I’ve spoken before about the street we live on — it cuts between two neighborhoods, so is extremely well-travelled, especially in the mornings and late afternoons. Many of the passing vehicles are blaring music — of any number of genres — at decibels you would hardly think tolerable to those inside. Motorcycles, unmuffled, scream by. Bicycles pant uphill. Leafblowers spread din and dust. People, alone or in pairs, search for cans in trash bins. Bang. Clatter. Roll. There is noise, there are fumes, there are humans of all stripes. But walk across the street, down a one-block lane that runs perpendicular to our house, and turn the corner at the end. You will dead-end into a wide, wild, and utterly untended field. True, there is a red pick-up truck parked at its edge; it is swamped in dandelions, and bears an “El Salvador” bumper sticker. But from there — except for the occasional plastic bottle — the man-made falls away. It is all tall dry grass, low, leafy trees, spreads of wild nasturtium, and abundant clusters of high, fuzzy flowers that look straight from a Dr. Seuss book. A slice of the field — where we walk — is flat, but the greater part of it climbs up a hill and disappears, like a great, grassy quilt thrown over a rounded sofaback. MJ and I used to come here a lot with Mina. It seemed a great place to let a hyper dog stretch her legs. I would let her off leash, and Myra-Jean and I would poke at stumps or pick flowers while Mina bounded ecstatically through the grass like an overgrown, gangly-eared hare. Then came our catastrophic skunk encounter. After that we still went to the field occasionally, but only to the edge. And I stopped letting Mina off leash altogether. When coyotes started making regular appearances nearby, and neighbors told us they gathered in the field in droves, we stopped going completely. There were other places to walk that were less bucolic, perhaps, but slightly more predictable as well. Then, a couple of days ago, we ventured back. And I’m so glad we did. If for no other reason than the flowers. The ones above, that is. I have no idea what they are, but they’re in bloom right now, and they’re quite spectacular. When we came to the field before we could see only the dried out “corpses” of last year’s crop. I wondered what they were, but there was little to be inferred from their browned-out, powder-puff leavings, except that they were strange, plentiful, and extremely tall. Imagine our delight, then, when we walked back into the field — Mina pulling happily against her leash — and found that, amongst the dried-out relics, new incarnations of this odd flower have sprung up everywhere. 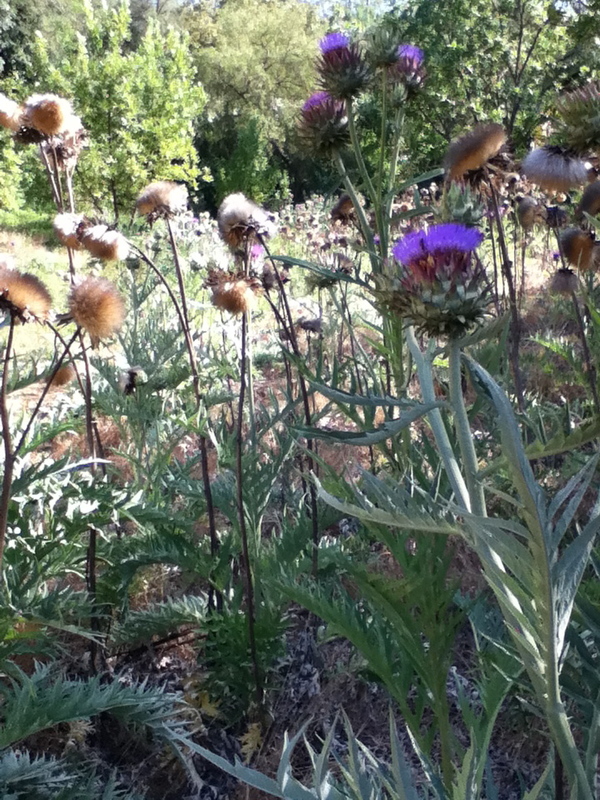 They are purple, they are prickly, they tower higher than me. They look a bit like artichokes. Every day, now, we go back to the field. MJ will have it no other way. We make plenty of noise, to scare off the critters. We pull our hats down against the implacable midday sun. We wear sensible shoes. And we walk amongst purple, Lorax-y giants. Around us we hear mockingbirds, mourning doves, and the wind, skimming through the brown and green harp strings of the field. Oh, and the occasional ghetto blaster, too. But from Very. Far. Away. 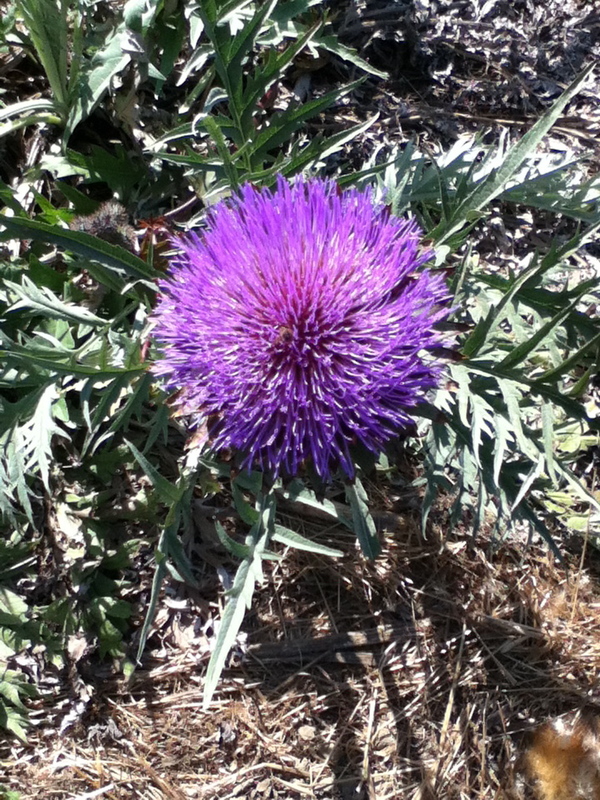 This entry was posted in childcare, Garden, Outings and tagged big purple flowers, empty fields in los angeles, wild artichokes on June 19, 2012 by thumbstumbler. 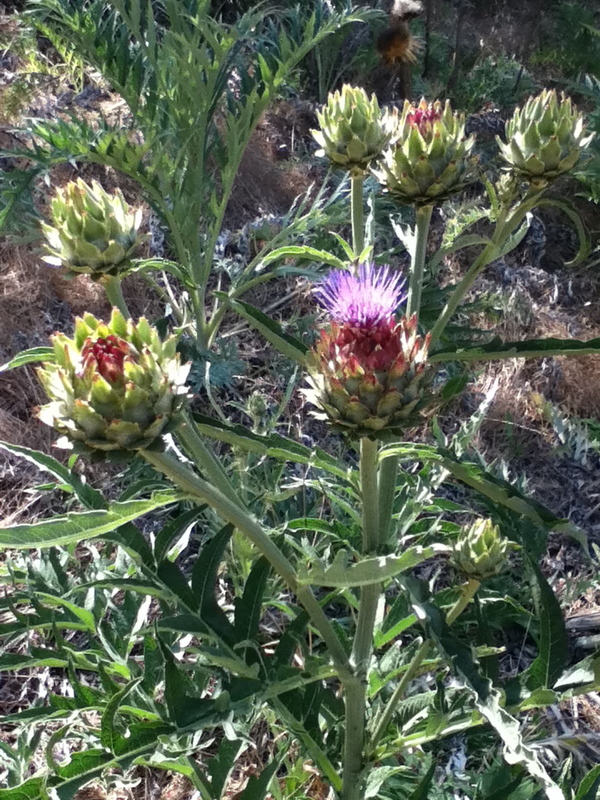 They ARE artichokes – I wouldn’t vouch for their edible qualities at this stage of their feral lifestyle, but artichokes are a thistle and have big purple blooms, who knew? This is a wonderful place, part of what I love so much about LA. 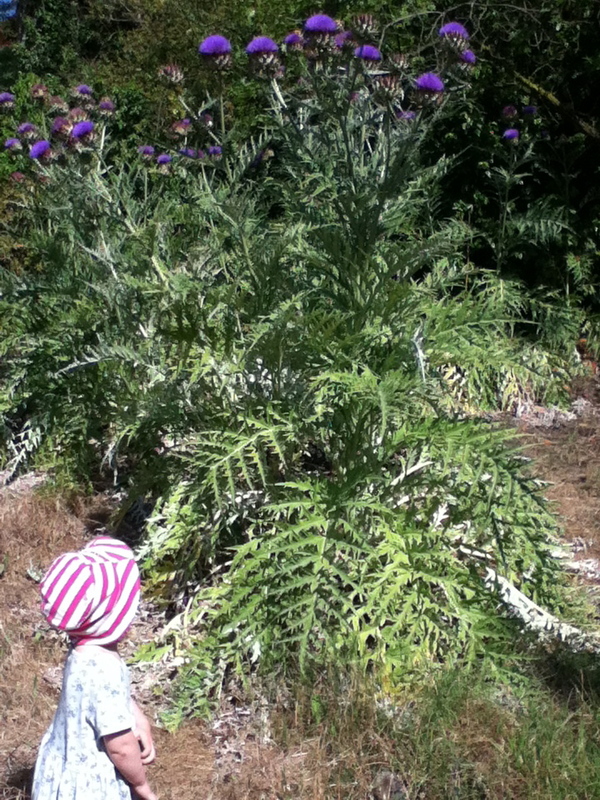 Don’t artichokes look like plants from another planet? Anyway, love how you capture the spirit of LA, love your wit — you’ve got yourself a new subscriber.